The small church, of the type that is an engraved cross within a rectangle, may be found on the plain that dominates the valley of the river Arpa, from which this site takes its name. Built by the architect Momik in 1321, the area of its base forms a parallelepiped in which two arches open to the south and west. Both doorways have square frames and are surmounted by lunettes depicting the Madonna and Child. 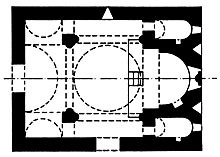 The inside is characterised by the presence of two free, well composed pillars in the western zone, a placement that is rather rare in Armenia, rendering almost all the space available in the lower area united and communicating of which only the two small apse rooms used for the liturgy remain excluded, next to the apse. The church rises inside an ancient cemetery rich in tombs, graves and xack’ar.